After nearly four months in South America, our time here is drawing to an end. We chose to spend our final weeks enjoying Colombia’s Caribbean Coast. 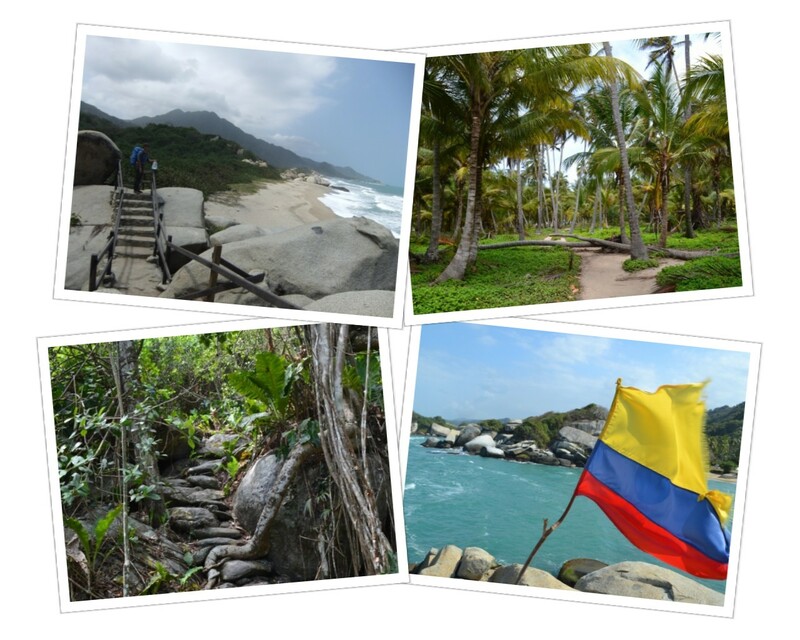 We booked a flight from Cali to Santa Marta with the aim of exploring Tayrona National Park. Unfortunately for us, our flight that was supposed to arrive up north just after 9pm was three hours delayed. For most people that travel regularly in the US, a three hour delay is fairly routine, annoying yes, but not a big deal. Apparently, this is not the case in Colombia. The flight delay turned into quite an ordeal. First, the captain came out to the gate to personally announce the delay and explain the reason; a flight attendant had fallen ill and could not make the return flight. The crowd exploded in an angry roar; from that point on, it was impossible to hear any of the announcements being made about the delay. Can you imagine an airline providing a reason for a delay other than “technical issues”?! Every time an airline official tried to take the microphone, the complaints from the crowd got louder. Then, our luck changed. Our delayed flight turned into some free food. To try and calm things down, the airline decided to give out sandwiches and juice. After 14 months of traveling, we will take any free meal we can get! When we finally did arrive in Santa Marta, it was after midnight and there were only a few taxis still lingering around at the airport, so we had to share with a stranger. The driver told us, “no problem, I just need to drop this guy off in a neighborhood nearby.” What he didn’t tell us until we were already on the road was that the neighborhood is the ghetto of Santa Marta. As we drove further into the barrio, the driver slowed down to ask some rough looking guys for directions. This is when we both thought, “Great, almost done with Colombia and now we are going to get robbed in the classic taxi scam that we have heard so much about.” But oh, ye of little faith, we were wrong and thirty minutes later were finally safe and sound at our hostel and ready for some sleep. The next day was spent gearing up for our Tayrona camping trip. Canned tuna, fruits & vegetables, 18 liters of water, bug spray and a bottle of rum all made the shopping list. It wasn’t until we got back to the hostel and started packing up that we learned some dreadful news: bringing alcoholic beverages into Tayrona National Park is prohibited…nooooooo! But being the optimists that we are, we decided that there are worse things in life than being in the Caribbean with a bottle of rum that needs to be consumed in an expedient fashion. The next morning, we fought through some mental fog and made our way by bus to Tayrona National Park. Getting into the park itself proved to be a bit of a process. First, they search your bags for plastic and styrofoam, neither of which are allowed inside. Next, you go through a police check point where you get questioned and searched again, this time for drugs, weapons and alcohol. Once you’ve made it through both of these steps, then they let you fork over the 38,000 Pesos for the entrance ticket; a colorful wrist band gets slapped around your hand and off you go to hike to the beach. The walk itself was beautiful; it cuts through the dense jungle, in and out of coconut groves, up to viewpoints of the ocean and finally onto the sandy white beach, however, it was a very sweaty and exhausting journey and we were glad to find a place to camp at the end of the trail. When we departed Santa Marta for Tayrona, we didn’t know how long we would stay, but the tranquil beaches and awesome camping spot made us want to hang around a little longer. 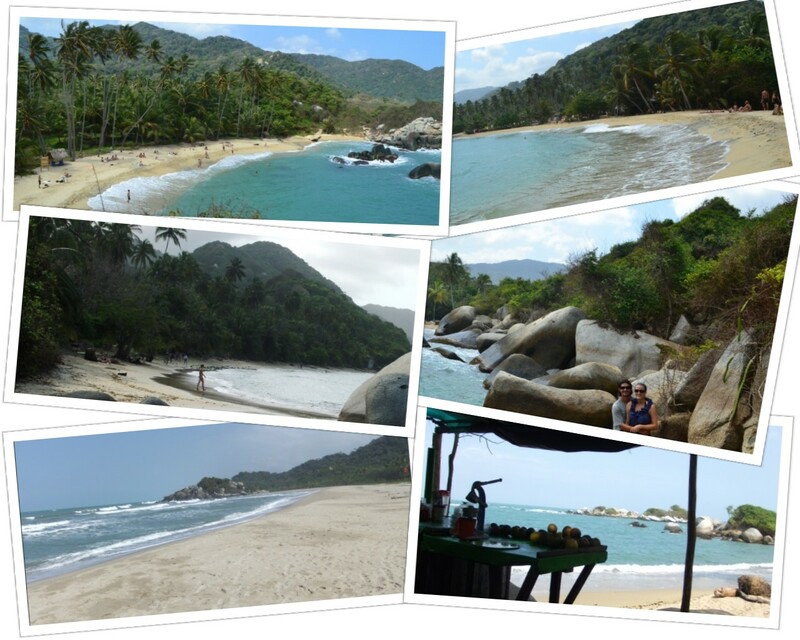 There isn’t much more to do in Tayrona other than lounge on the beach and hike, and that was plenty enough for us. Both are right up our alley. 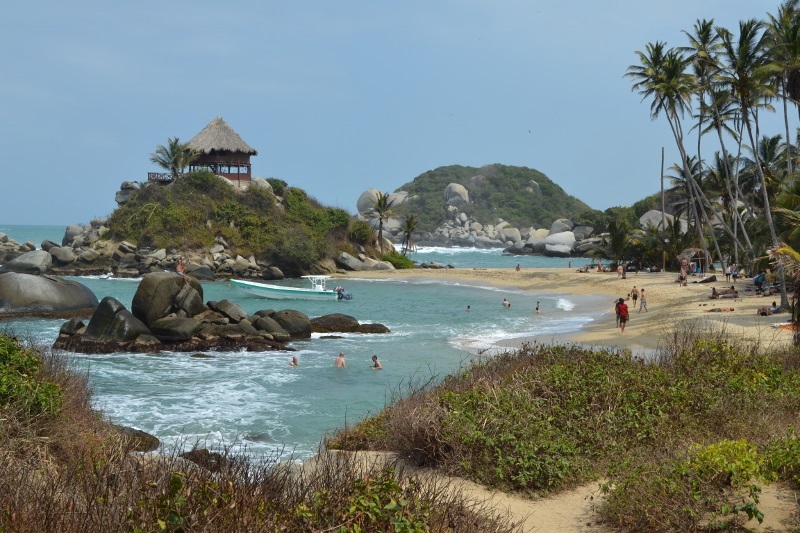 Part of the beauty of Tayrona is that each beach is its own cove, all of which are strung together by footpaths through the jungle. Every day we explored a new spot. While many campers choose to set-up near the beaches, we opted for something less crowded, more laid back, and a lot more affordable. 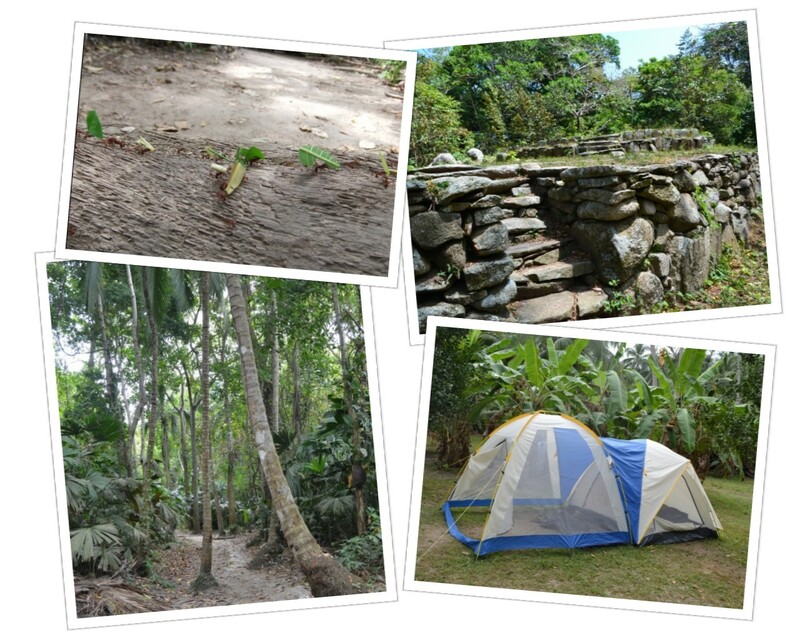 We found a campsite nestled in the jungle about 10 minutes walking from the sea. Being away from the water meant longer hikes every day to the beaches and archeological sites in the park, but we didn’t mind one bit. Even at that distance from the water, Tayrona is so remote that we could still hear the crashing waves from our tent at night, and during our daily treks we crossed paths with some of the craziest ants we have ever seen! Countless ant super-highways were strewn about the jungle. We couldn’t help but to extend our days in Salento. It is like summer camp for adults. At the beginning of our stay, we had reserved only three nights, and then we added a few more, and then a few more, and before we knew it, we’d been there for more than a week. It is the perfect place to slow down and relax. 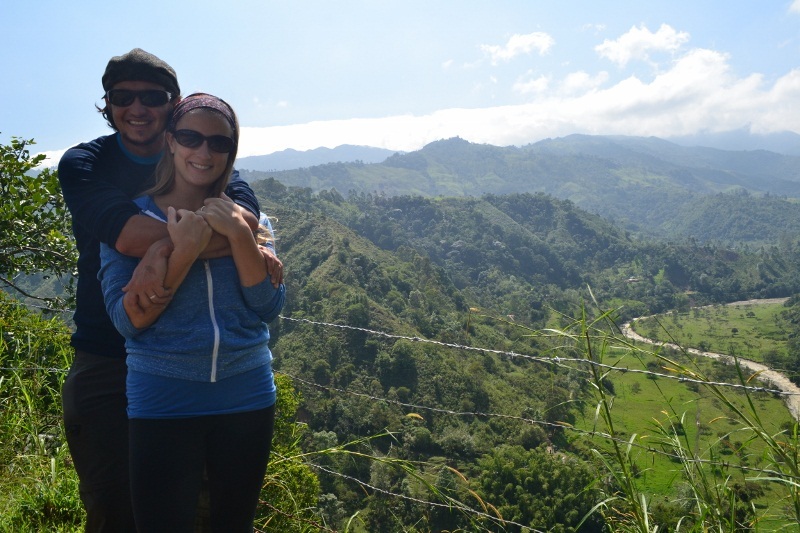 If it weren’t for the flight we’d booked from Cali to the northern coast of Colombia, we may have stayed forever. 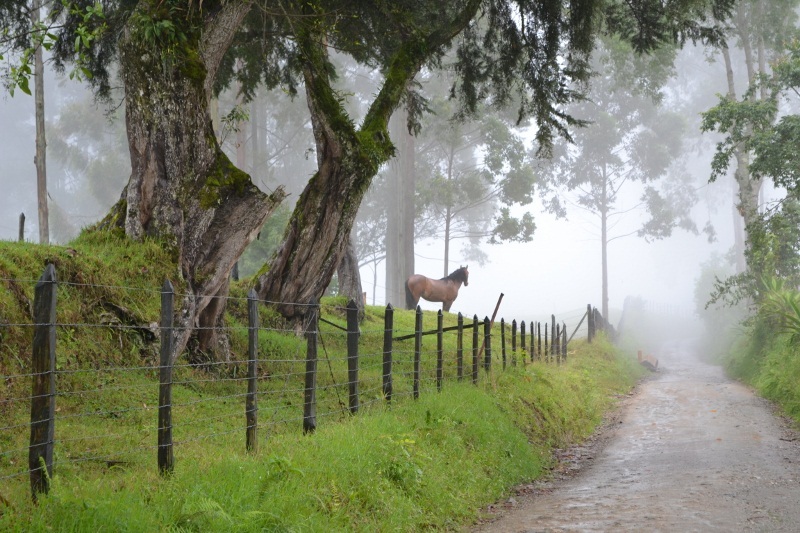 Hiking, coffee fincas, mystical clouds swirling around the green hills, great meals with great people, hammocks, games of tejo, delicious trucha con patacones, rainy days, campfires, fireflies, card games, movie nights & popcorn, humming birds, wax palms, hot springs…what is more to love? 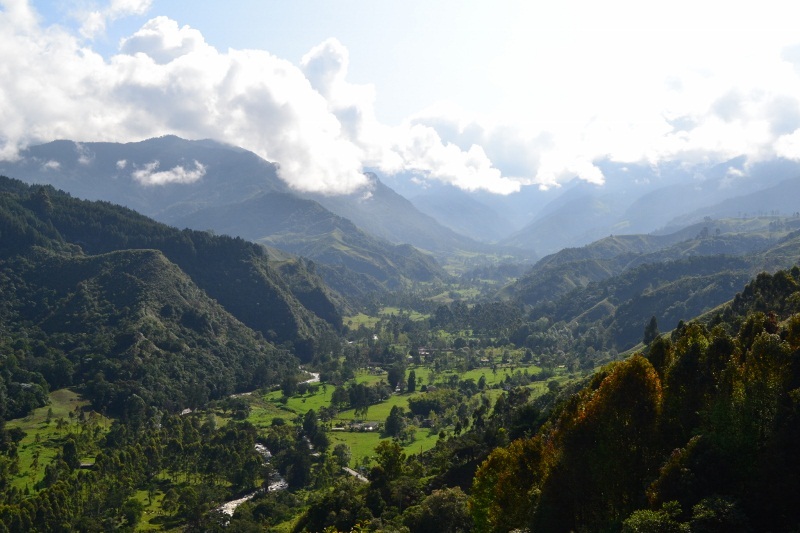 We were lucky to catch this view of the Cocora Valley from the mirador in Salento, as clear days are few and far between. We don’t normally advertise the places we stay on our blog, but La Serrana Eco Farm & Hostel was a big part of the reason that we chose to slow down our travel pace and just soak it all in. It is about a 20 minute walk from the town center and provide peace and serenity, especially on foggy mornings like this. We truly enjoyed our quiet walks through the country side. To be clear, La Serrana offered us nothing to mention their name, we just loved the place. 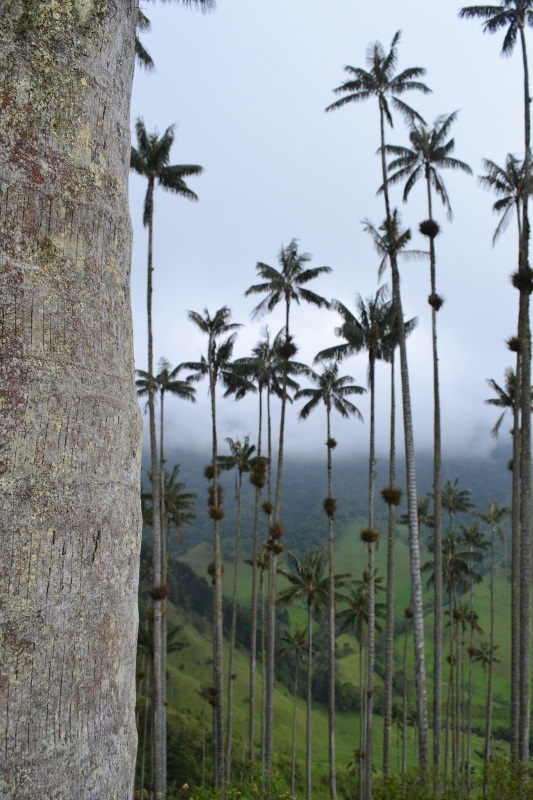 Hiking through el Valle de Cocora is likely Salento’s biggest tourist activity. 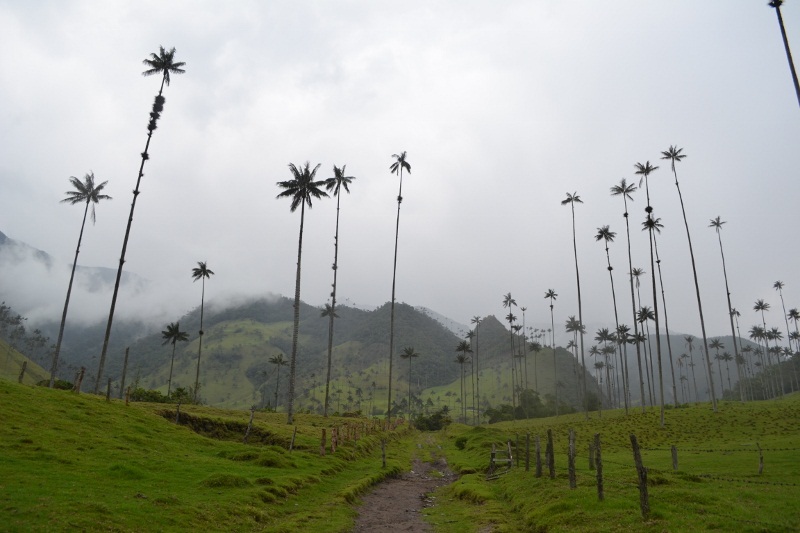 These towering wax palm trees cover the valley floor and are stunningly beautiful. 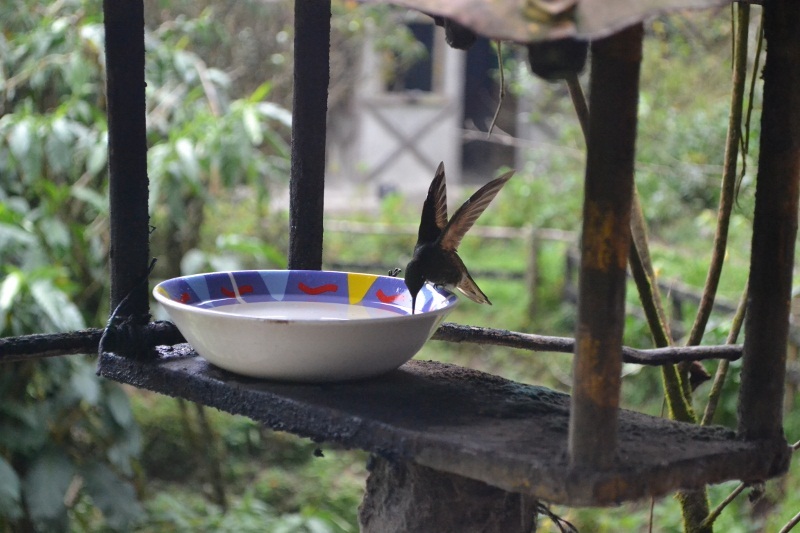 After hours hiking, we stopped at a humming bird sanctuary, which was really more of a rustic lodge run by an elderly couple. Who said humming birds can’t be captured mid-wing flap? One Croatian traveler hiking the trail with us said it couldn’t be done without a tripod and special camera. Mike begged to differ and got this shot in just a matter of minutes. 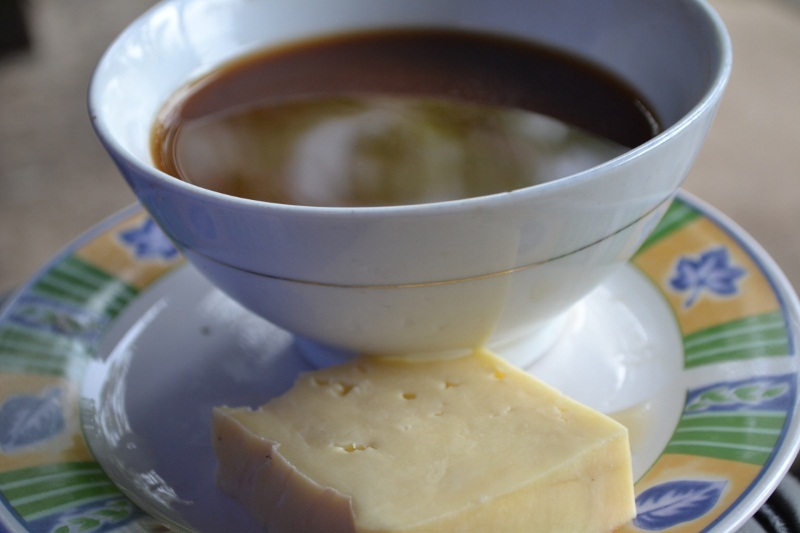 Divine chocolate caliente con queso served at the humming bird sanctuary. As we descended back down the trail and out of the fog, we found ourselves once again surrounded by wax palms reaching towards the sky. 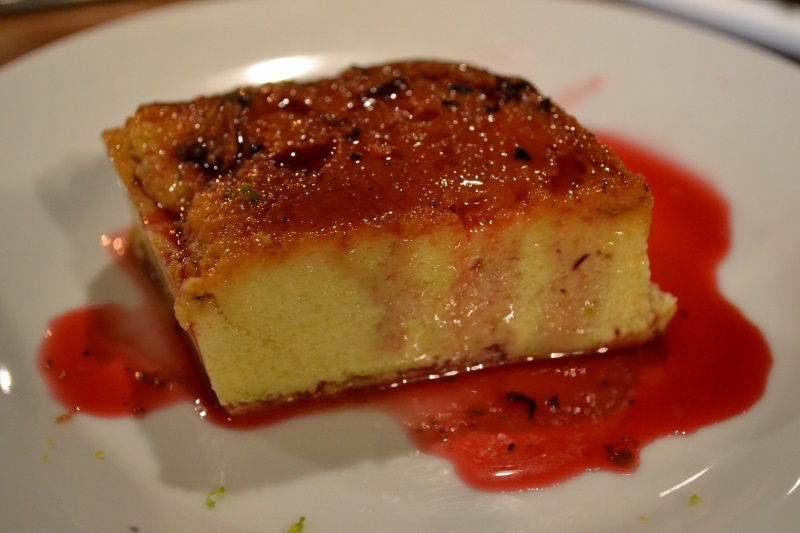 Have you ever had avacado flan? We hadn’t either before the incredible 8-course tasting menu prepared for us by Chef Michael Neff, a fellow guest at our hostel in Salento. Communal meals in the dinning hall added to the summer camp feel. 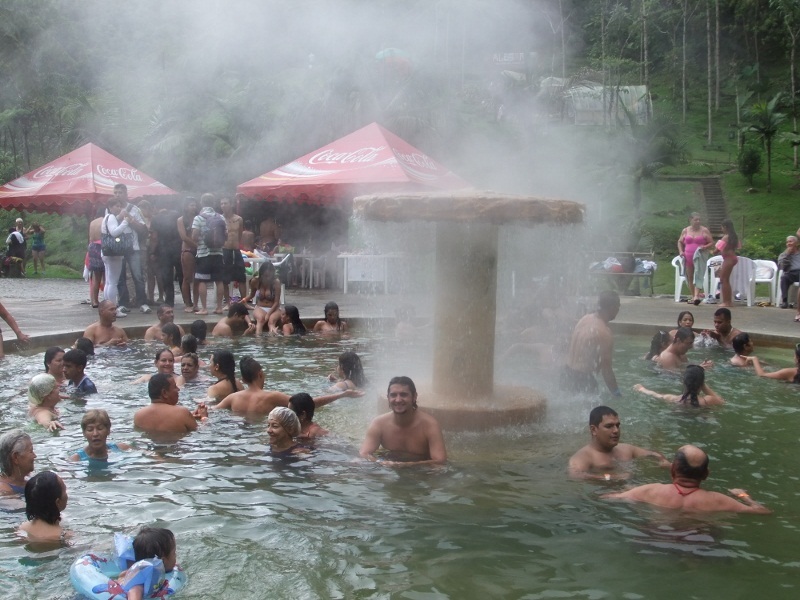 Hot springs Colombian style: pumping music, back flips, party time. Not exactly the relaxing day that we had envisioned for ourselves, but enjoyable nonetheless. 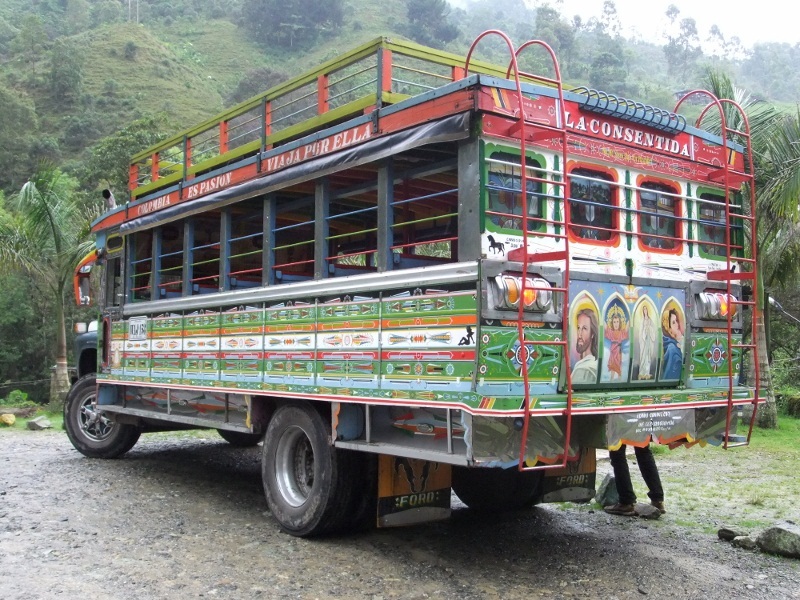 This chicken bus to the termales in Santa Rosa de Cabal made our day! Riding this bus turned out to be better than the hot springs themselves. The salsa music was blaring, and the driver slowed down to holler at every señorita in town. The weather in Salento seemed to rotate between rain and shine. 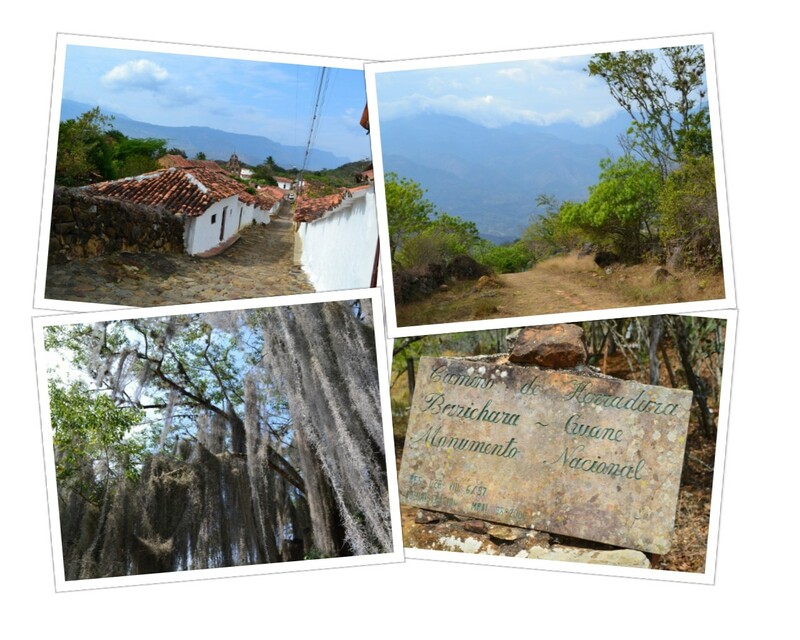 We took advantage of the sun one day to hike down to a nearby coffee finca. With views like this all around, you can imagine why we chose to stay for a while. 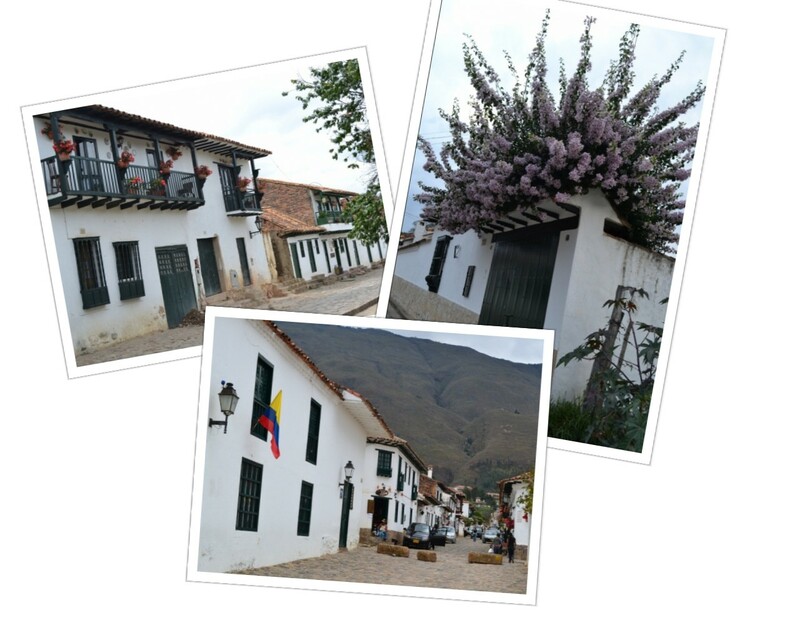 We took a tour of Don Elias’s coffee finca not far from our hostel. 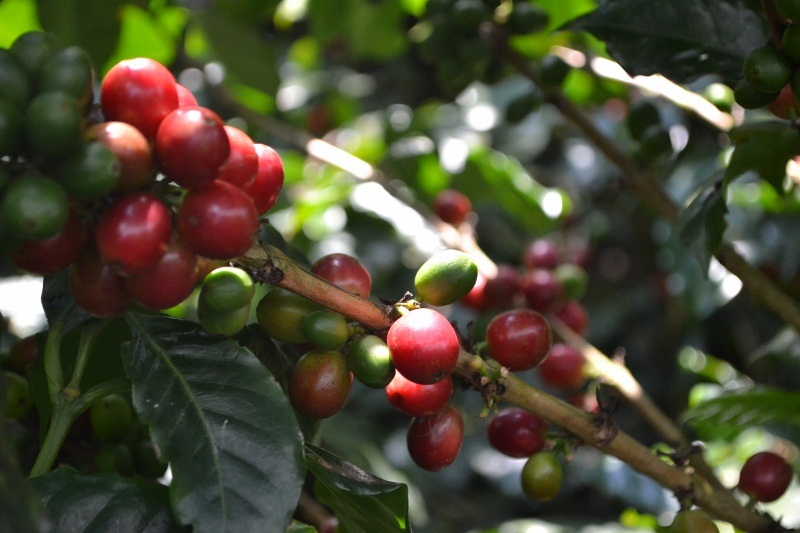 When these arabica beans are bright red, they are ripe and ready to pick. Don Elias and his family run a very small operation. This peeler is the only one they use to remove the skins from all of their beans. 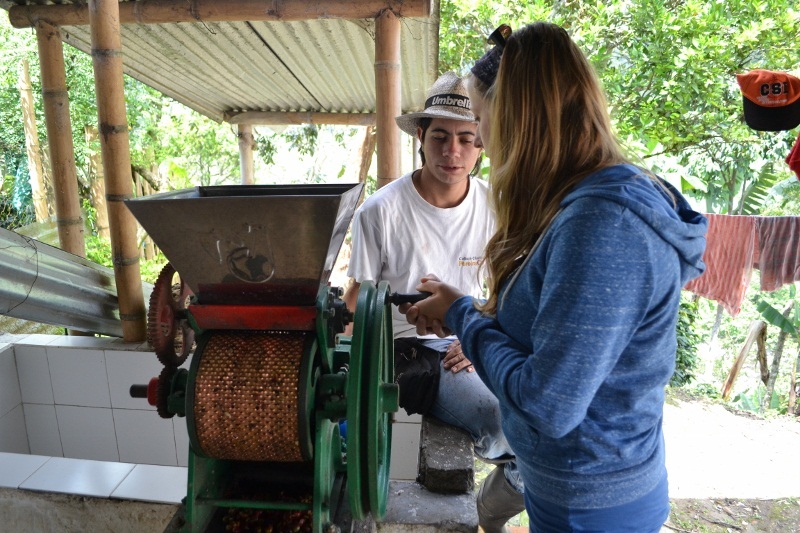 Our tour guide, Juan, walked us through the entire process from planting the crop to brewing a cup. It was some of the best coffee we have ever tasted. 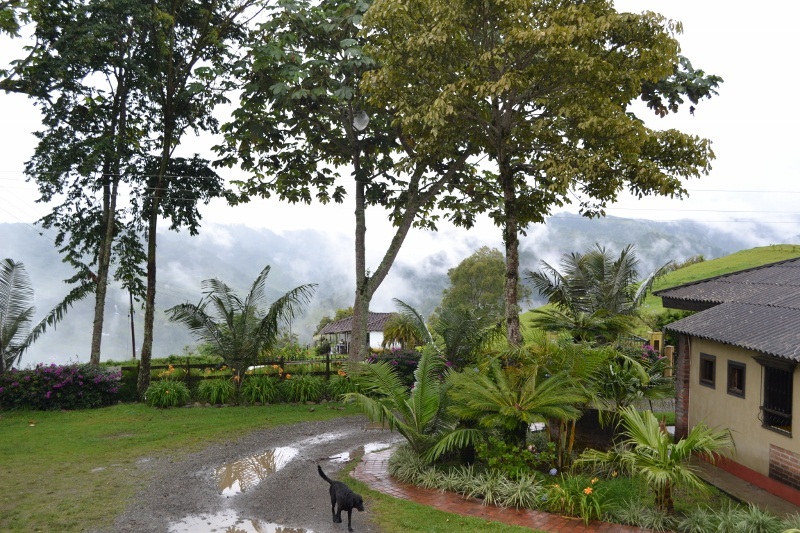 One last look at our misty retreat, La Serrana, and the loyal house dog, Pablo. And what an amazing place it was indeed. As Colombia’s third largest city, Medellín is home to millions. It has many of the things that you might expect to find in a big city: high-rises, freeways, airport, museums, and a truly world-class metro system. 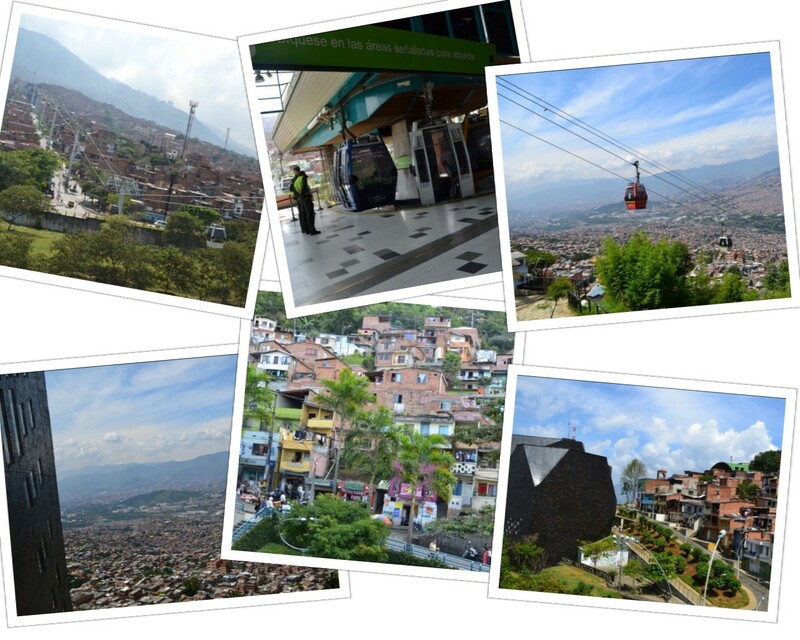 What makes Medellín so special, however, is its location amongst lush green mountains. We spent our few days in Medellín seeking out the best spots for taking in views of the city from the surrounding mountains and hills. First up was the Line K Metrocable, a gondola that serves as public transportation for people that live in the hilly barrio of Santo Domingo at the northeastern end of the city. The views are incredible on a clear day and the price can’t be beat. 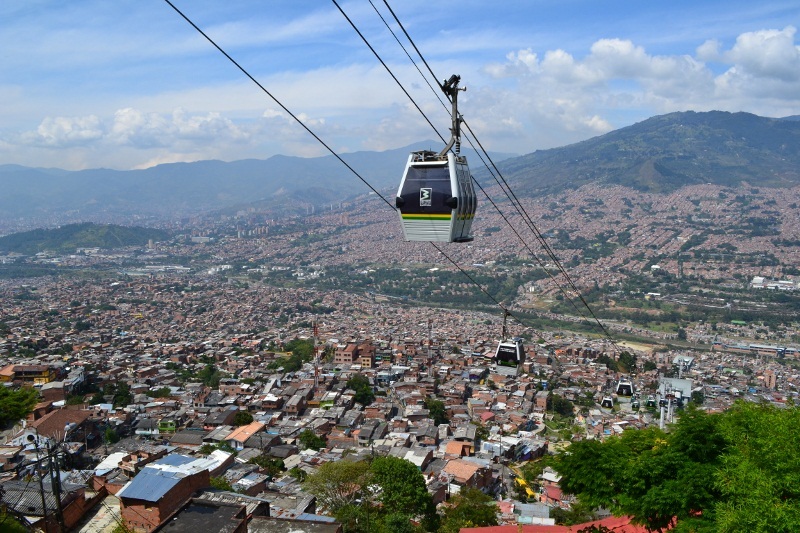 Since the metrocable is integrated with Medellín’s metro system, for less than $1 USD you can go from any metro stop in the city up the gondola to la Biblioteca España. For only a few dollars more, you can transfer to the Line L gondola, which takes you to the brand new nature preserve called Parque Arví. At first, we thought that the park was just a few hundred meters further up the mountain, but as it reached the top, we saw a massive expanse of green forest in front of us and a gondola line that stretched for kilometers. Riding Line L felt like flying over the wilderness. It really made us miss skiing in the mountains of Colorado and was a very welcomed surprise. 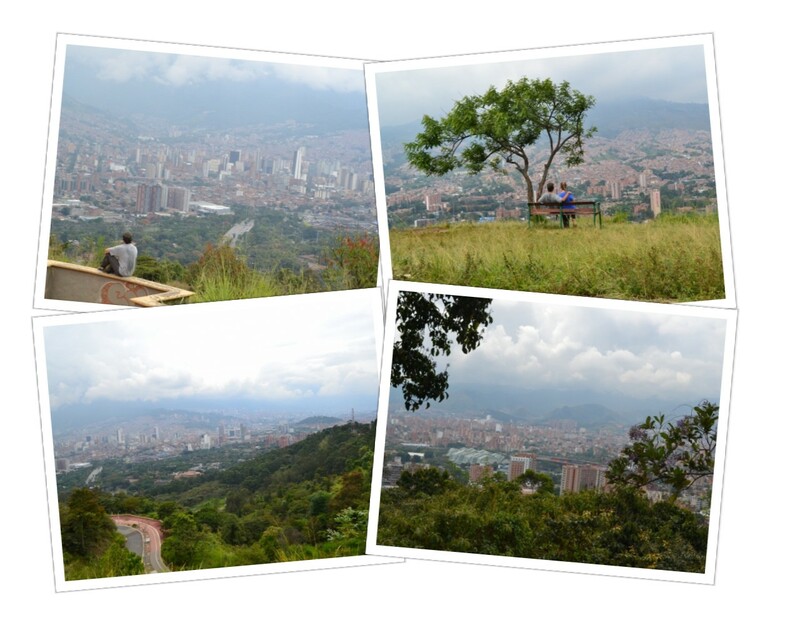 What a cool way to connect the bustling city of Medellín with the tranquil nature that surrounds it! Another fantastic place to see 360˚ views of the jewel amazing is Cerro El Volador. Its location along the main road of Carrera 70 makes it easy to access, and its proximity to the central business area provides especially nice views of the mountains with the cityscape in the foreground. The walk up is steep, but definitely worth it, and the benches at the summit are the perfect place to take a long rest. 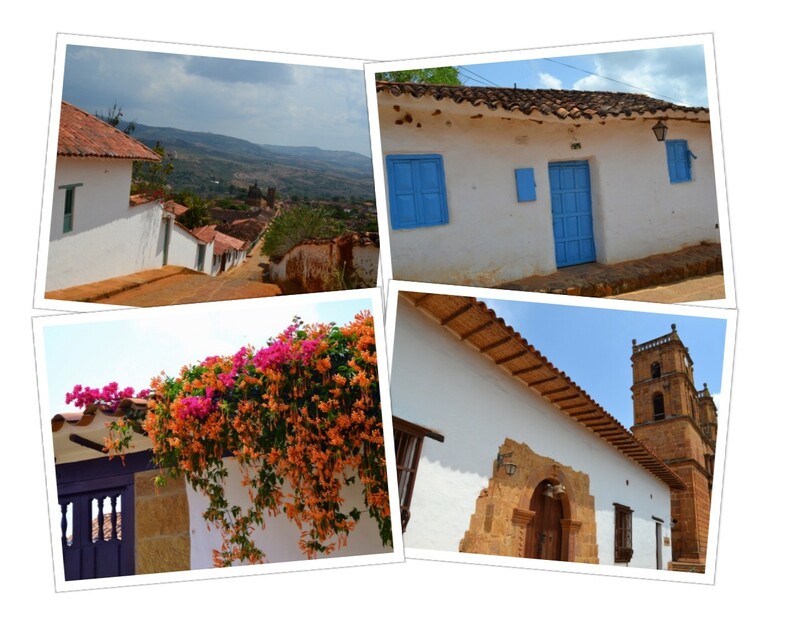 We found El Volador much more beautiful than the famous Cerro Nutibara where Pueblito Paisa is located, a touristy recreation of an old colonial village. There are no doubt countless other places to absorb the mountains views of Medellín, and hopefully on our next visit to Colombia we will explore a few more. But for now, we are recommending Cerro El Volador and the Line K Metrocable. We’re not going to lie; we were a little scared to arrive in Bogotá. You know its reputation (moms, don’t read this): armed robberies, narco-terrorists, car bombs, kidnappings, drugs and the like. 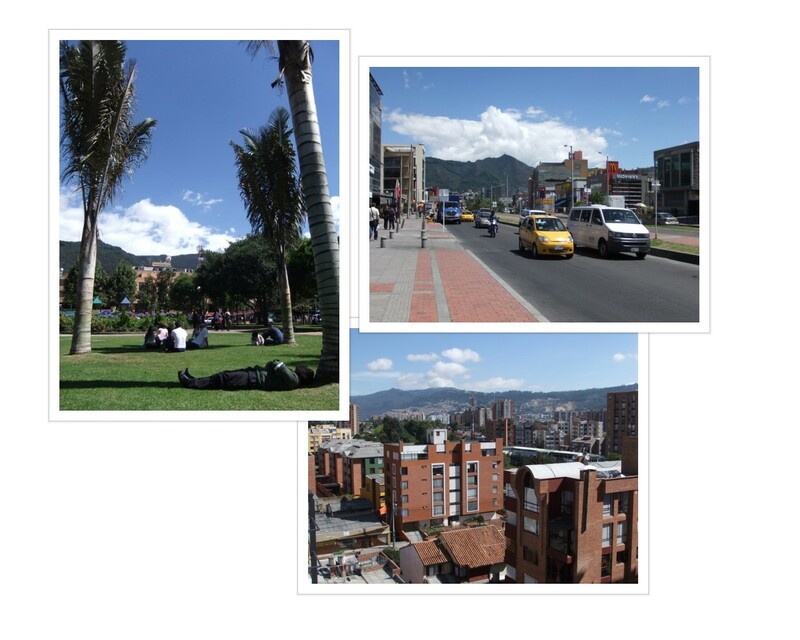 But, after just one day in Bogotá, we were feeling a lot better. It’s not as scary as you would think! 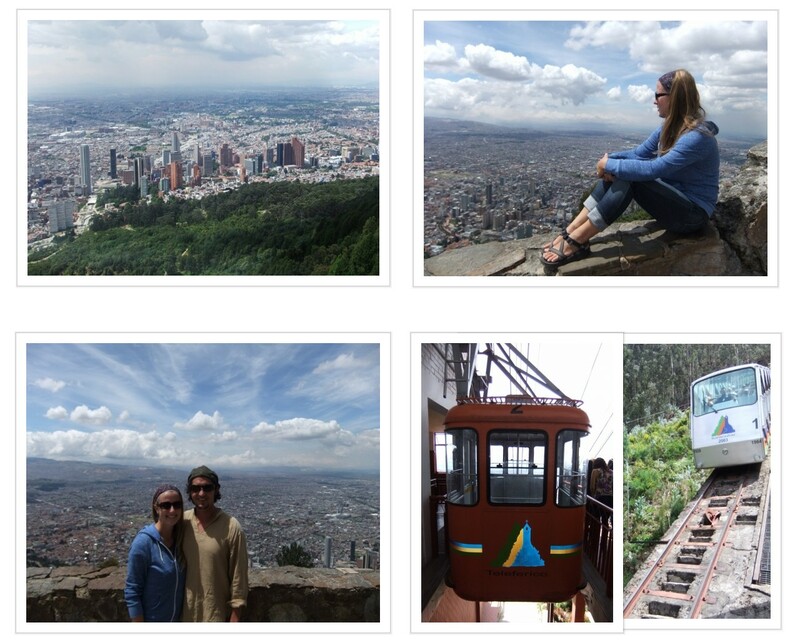 Bogotá is a BIG city and one of the best ways to grasp its size is to take a trip to the top of Monserrate. Bordering the city to the east, the church located at the top of this mountain provides breathtaking panoramic views of the city. Wait for a clear day, and you can see right across the valley. There are three ways to get to the top of Monserrate. 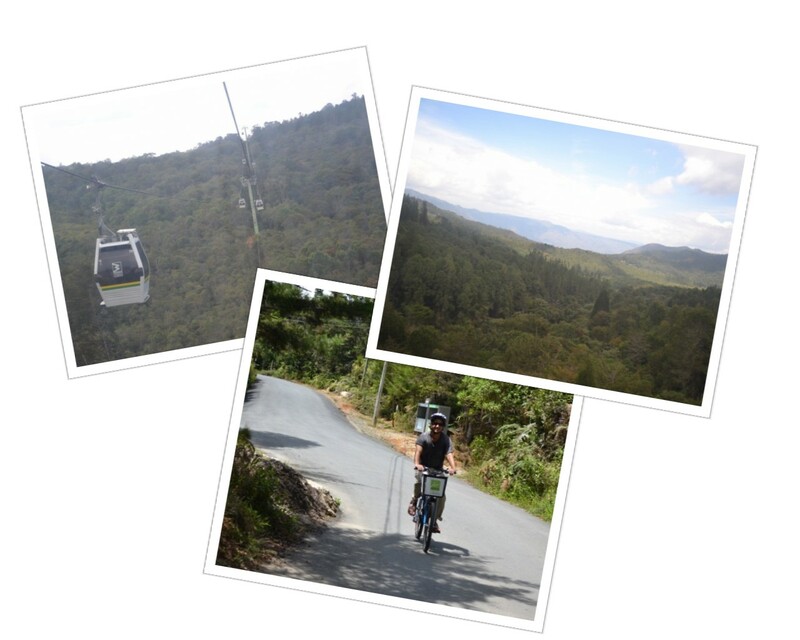 The easiest methods are via the funicular and gondola (teleférico) which operate on different schedules. Those looking for a good workout can hike up the mountain, but be advised that the trail is closed every Tuesday for maintenance. Our advice is to take the funicular up just before noon, spend a couple hours on top, and then ride down on the teleférico. Those looking for a bargain should go on Sundays, when tickets are much cheaper. All big cities have some sort of public transportation system, and while Bogotá doesn’t have a subway or light rail, it does have TransMilenio. This bus system is truly incredible. It is like a train without tracks, with two lanes in each direction dedicated solely to the system’s red buses. The numerous lines connect north, south, east, west and in between. Your biggest danger while in Bogotá may be getting suffocated by the mobs of people on TransMilenio during rush hour. For those tourists brave enough to venture out of La Candelaria, TransMilenio is a cheap and efficient way to move about the city. 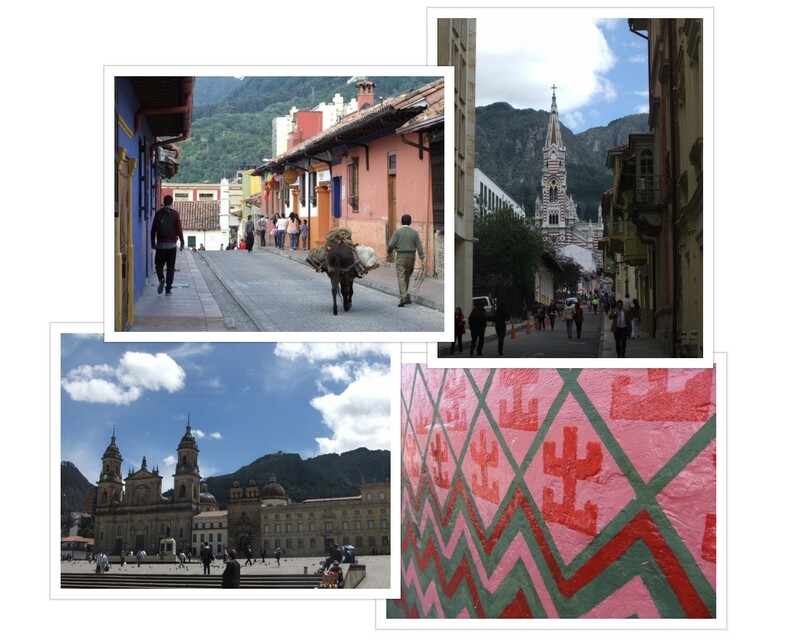 And there is so much more to Bogotá than La Candelaria, trust us. At first sight, Bogotá is a bit rough around the edges, but when you dig deeper the city actually has some very ritzy neighborhoods as well. Venture north from el centro to areas like Los Rosales, La T, Usaquén and Parque de la 93, and you will find many well-dressed business people and socialites enjoying fine-dining, lush parks, designer shopping and trendy cocktails. 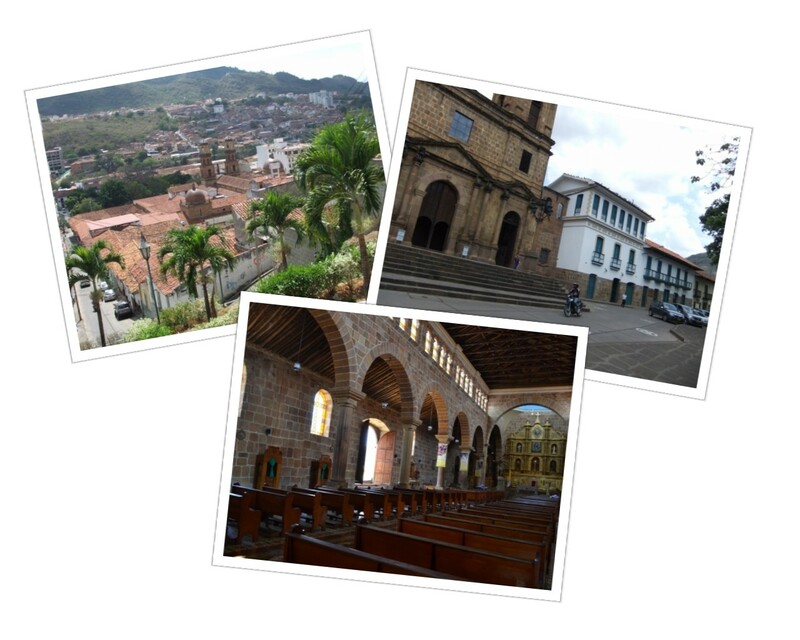 If you enjoy the see and be seen type of atmosphere, northern Bogotá is for you. It is interesting to see the extremes of the city; you can go from a run-down working-class area to up-scale and polished neighborhood in less than an hour walking. So now for the scary part…wait, there wasn’t a scary part. 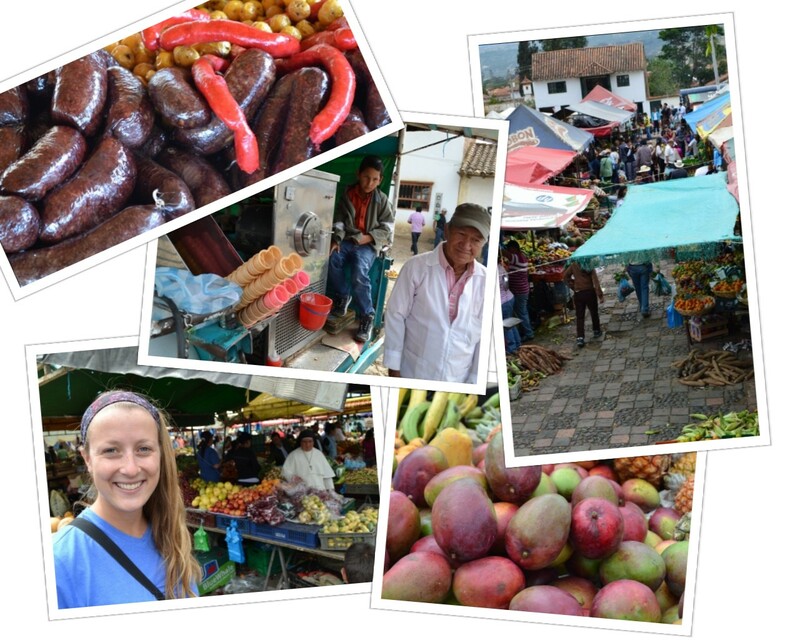 The only things that we found frightening about Bogotá were the preconceived notions that we had in our head. Our five days there helped us to appreciate just how much brief news stories and second-hand accounts can unjustly skew one’s opinion of a place. Don’t take us for naive, we know Bogotá isn’t the world’s safest city; bad things do happen there, but they can happen anywhere. When you let fear dictate your actions, then the bad guys win. 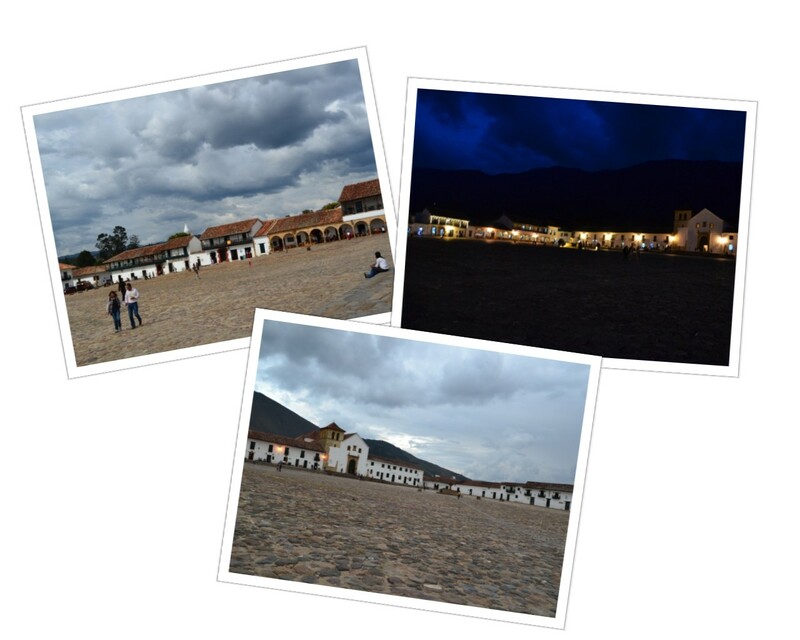 So if you have ever wanted to visit Bogotá, there is no time like the present.